Honda gambled by completely overhauling the Civic styling and platform. It paid off, as the 8-th-gen Civic remained the second-best selling compact car in the US, only behind Toyota Corolla. 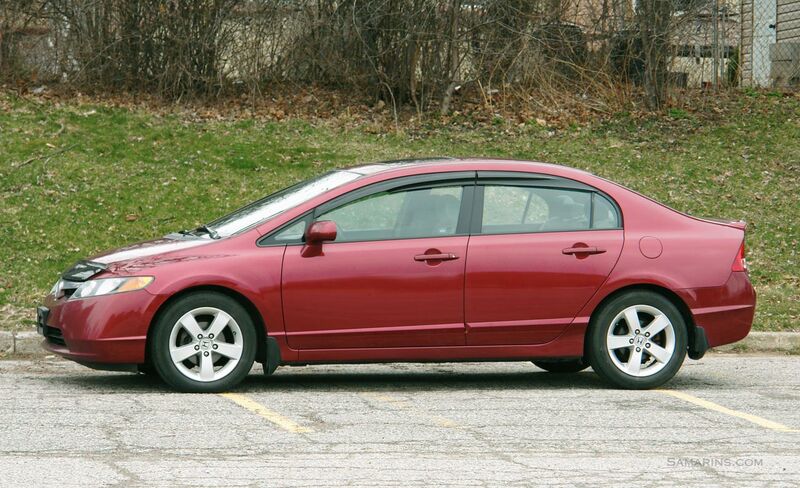 The 2006-2011 Honda Civic comes as a sedan or coupe. It has front wheel-drive and a sporty 4-wheel independent suspension. The Civic's fuel economy is among the best in its class. Maintenance costs are low. The overall reliability is above average, but there are several issues used car buyers should be aware of, read below. 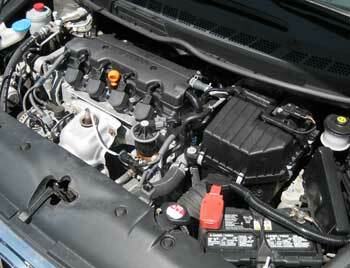 Problems: There are some complaints about a cracked engine block in 2006-2009 1.8L models. 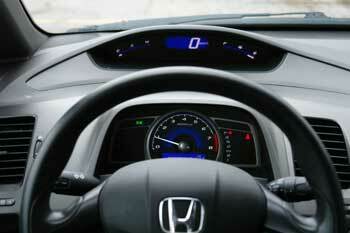 According to this post at Consumer Reports, Honda has extended the engine warranty to 10 years with unlimited mileage. Read this discussion. This thread at 8thcivic.com also talks about this issue. The 2006, 2007 Civic rear suspension is another weak spot. Rear tires tend to wear unevenly on the inside (cupped tires). This may cause a vibration and a rumbling noise coming from tires. To correct the issue the Honda Service Bulletin 08-001 recommends installing a new rear upper control arm kit, replace the flange bolts and perform the four-wheel alignment to the new specs. A bad engine mount can cause vibration and rattling noise at idle. A faulty wheel bearing can cause a humming noise noticeable at higher speeds that gets louder when changing lanes. Replacing one front wheel bearing costs from $180 to $450. Check Engine light issues are not uncommon. Read how to deal with Check Engine light. Powertrain: The Civic DX, LX and EX models have a 140-hp SOHC i-VTEC 1.8L 4-cylinder engine and a 5-speed manual or 5-speed automatic transmission. The Civic Si comes with the 197-hp 2.0L DOHC i-VTEC inline-4 with high compression ratio (11.0:1) and for that reason, requires premium gasoline. Timing belt or timing chain: Both, the 1.8L and 2.0L engines use a maintenance-free timing chain; there is no timing belt to worry about. Fuel Economy: The EPA rates the 2009 Civic with a 1.8L engine and a 5-speed automatic transmission at 25/36 MPG (9.4/6.5 L/100 km) city/highway. This means that in regular driving conditions you can get up to 383 miles (616 km) one a 13.2-gallon (50 liter) tank. The 2009 Civic hybrid gets 40/45 MPG city/highway. 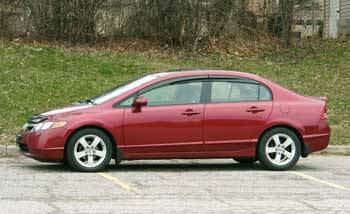 The 2009 Civic Si manual is rated at 21/29 MPG (5.9/5.2 L/100 km). Ride and handling: On the road, the Civic handles well, better than Toyota Corolla, although not as sporty as Mazda 3. The steering is precise and responsive; turning radius is good. The ride is on the firm side and you will hear some road and tire noise. The 1.8L accelerates easily and offers adequate power for daily driving. Safety: Anti-lock brakes, side and side curtain airbags are standard. Vehicle stability control is available in Si and EX-L models. The 2006-2010 Honda Civic received five stars for both the driver and the front passenger in the NHTSA frontal crash tests. Starting with 2011 models, NHTSA has introduced tougher tests, where the 2011 Civic is rated with three stars overall: four stars in the front crash test and two stars in the side crash test. For more details, visit Safercar.gov. Pros: Fuel economy, low maintenance costs, styling, sharp handling, holds value well, speedometer is close to the view of the road. Cons: Low seating position, interior materials could be better, lack of standard equipment in DX models, road noise, weak rear suspension, tires wear fast. Overall: The Civic remains one of the top choices for a small car. Consumer Reports rates a used Honda Civic as 'Good Bet' with predicted reliability rated 'above average'. Mazda 3 is the closest alternative; Mazda 3 is also reliable and offers more sporty handling. Mitsubishi Lancer is another sporty compact car. Toyota Corolla has a soft and smooth ride and is also very reliable, although it's not sporty. What to look for when buying a used Honda Civic: If you want the Civic DX, see if it has features you need. The air conditioner, power locks, cruise control and even the map lights were not on the list of DX's standard equipment. Check the tires, see if any of the tires appears to be "cupped" or worn unevenly. During the test drive, watch out for tire noise. Cupped tires can cause a rumbling or humming noise that changes with speed. Check the condition of the sunvisors; they were a weak spot in earlier models. Make sure the air conditioner works; there are many complaints on A/C working intermittently or not working at all. During the test drive of the Civic Si, watch out for a slipping clutch and see how the manual transmission shifts; all shifts should be smooth. Before buying, have the vehicle properly inspected. It's a good idea to check with a Honda dealer if all the recalls and engine computer software updates have been done. Interior: The digital speedometer is placed closer to the view of the road. Front seats are supportive; the driver's seat height is adjustable. An audio system in LX and higher trims comes with an auxiliary input jack. The USB audio interface is available on EX, Hybrid and Si models starting from 2009. 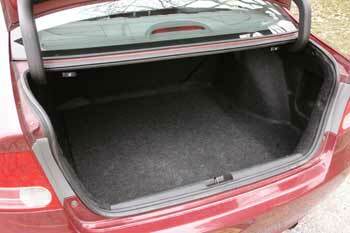 The trunk is spacious; the rear seatbacks fold down in all models except Hybrid. 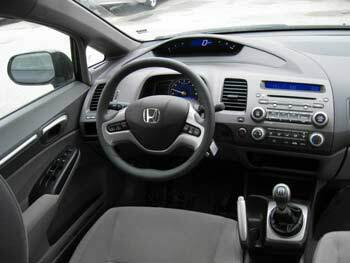 Honda Civic Hybrid: Available only as a sedan, the Civic Hybrid has a powerful electric motor sandwiched between a 4-cylinder 1.3L engine and a continuously variable transmission (CVT). 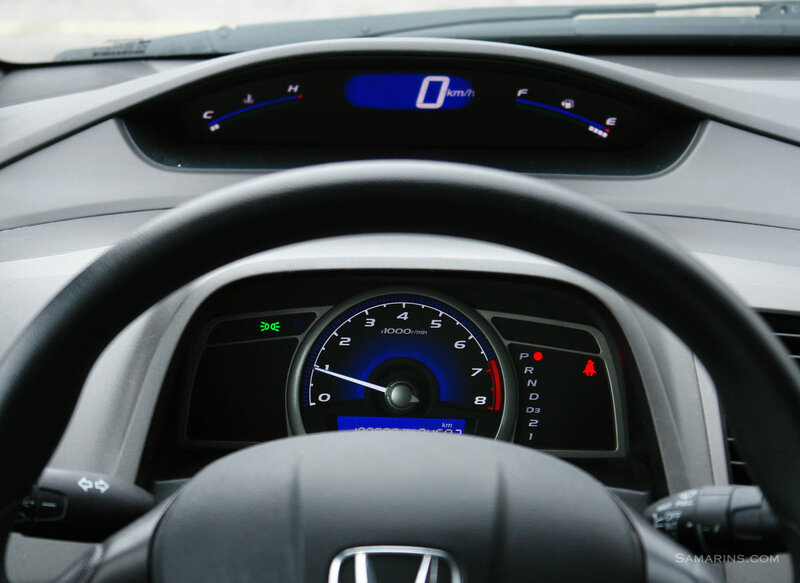 A used Honda Civic Hybrid is not very expensive, but according to Consumer Reports, the hybrid battery was a trouble spot, especially in the 2009 model. The battery warranty has been extended for some models. This article explains in more details. Lineup: Honda Civic comes in four trim levels: barebone DX, mid-level LX, sporty Si and top of the line EX, with features like leather-wrapped steering, heated leather seats and navigation. The sporty Civic Si comes only with a manual transmission and offers a stronger engine, firmer springs and thicker stabilizer bars. There is also a Honda Civic Hybrid and the very rare natural gas-powered Civic GX. 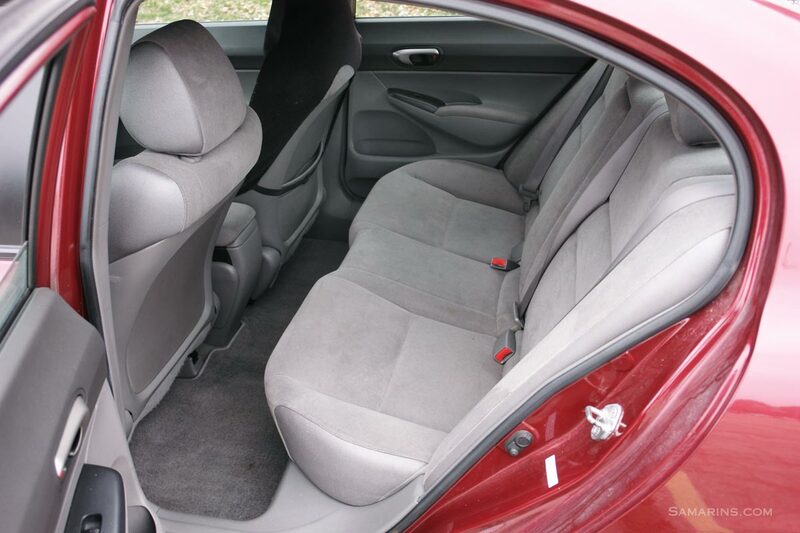 Maintenance tips: We checked owner's manuals for 2006-2011 sedan models. Honda recommends using 5W-20 oil in the 1.8L gasoline engine (Except Si) and 5W-30 oil in the Civic Si. Regular oil changes will help keep your engine in good shape longer. The 2006-2011 Civic uses the Maintenance Minder system that calculates oil life based on the operating conditions and engine revolutions. When your next service is due, the Maintenance Minder will display a message on the information display. The Maintenance Minder needs to be reset after completing the required maintenance service. You can find the instructions on how to reset the Maintenance Minder in your owner's manual in the Maintenance > Maintenance Minder section. For better handling, Honda Civic has an independent rear suspension layout where the rear tires can wear unevenly if not rotated regularly. The wheel alignment can help prevent irregular tire wear. Read this thread for more info on this subject. Owner's Manual and Warranty - read an owner's manual online, check what's covered by the warranty.